"God goes up the chimney. 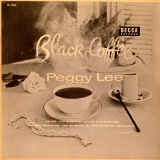 Like childhood Santa Claus"
Black Coffee is ranked as the best album by Peggy Lee. Members who like this album also like: In The Wee Small Hours by Frank Sinatra, Birth Of The Cool by Miles Davis and Chet Baker Sings by Chet Baker. The tracks on this album have an average rating of 74 out of 100 (all tracks have been rated). Related links: top tracks by Peggy Leetop tracks of the 1950s, top tracks of 1953. Showing latest 5 ratings for this album. | Show all 72 ratings for this album. Related links: top albums of the 1950s, top albums of 1953. What a record! The production, arrangements and vocal stylings are impeccable. A true classic! Beautiful, brilliant álbum, with the best renditions of the majority of the songs present on it.